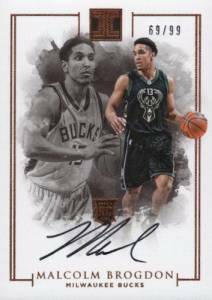 Making the move from one Panini-exclusive sport to another, 2016-17 Panini Impeccable Basketball is a super-premium release that averages five autographs in each box. The brand first entered the hobby with the 2016 Panini Impeccable Football set that established its reputation using multiple high-end elements. 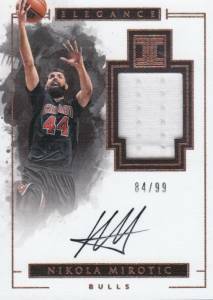 Understandably based around quality pulls, the 2016-17 Panini Impeccable Basketball checklist provides wide coverage of the league, promising top rookies, active stars and retired greats. 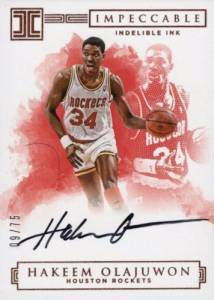 All of the autograph inserts in Impeccable are signed on-card, and at least one Rookie Autograph comes in each box. 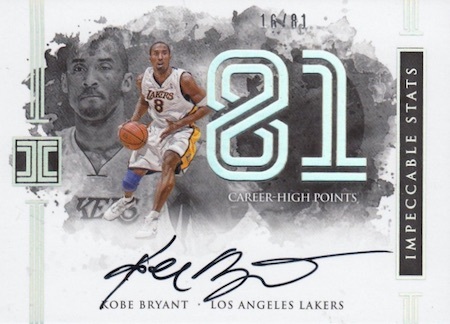 Other signed inserts include Impeccable Stats, which documents a key performance, and Indelible Ink. 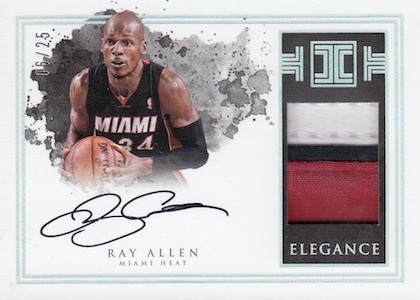 The autographed Elegance line offers vertical and horizontal designs that come with a jersey piece. Prime versions are limited to 25 copies or less. 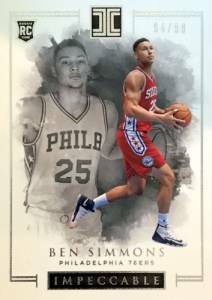 The debut set also features case-hit precious metal inserts: Silver NBA Logo, which is limited to 16 copies and contains one troy ounce, and half-ounce Gold NBA Logo, numbered to just 10 copies. The high-end NBA product has suggested retail pricing of $500 per box. 100 cards. Serial numbered #/99. Shop base cards on eBay. PARALLEL CARDS: Holo Silver #/25, Holo Gold #/10, Platinum 1/1. 34 cards. Shop on eBay. PARALLEL CARDS: Silver #/49, Holo Silver #/25, Holo Gold #/10, Platinum 1/1. 24 cards. Serial numbered #/99. Shop on eBay. 10 cards. Shop on eBay. PARALLEL CARDS: Silver #/49, Holo Silver #/25, Holo Gold #/10 (Billups - #/8), Platinum 1/1. All subjects not found in Parallels. View specific options with the spreadsheet. 29 cards. Shop on eBay. PARALLEL CARDS: Silver #/49, Holo Silver #/25, Holo Gold #/10 (No Jason Terry*), Platinum 1/1 (No Jason Terry*). All subjects not included in Silver / Holo Silver parallels. View specific options with the spreadsheet. 10 cards. Serial numbered #/10. Shop on eBay. 100 cards. Serial numbered #/16. Shop on eBay. 20 cards. Shop on eBay. 19 cards. Shop on eBay. 50 cards. Shop on eBay. 33 cards. Serial numbered #/49. Thought this looked interesting as last year’s football was rather nice. ..and while the product does indeed look nice a case still hides some pretty rough contents. Most of the cases I’ve been in or seen broken have been terrible and have made me reconsider just jumping into the football version when it comes out. For $1500 a case most cases (that I’ve seen) might hold value to the price of one box, $400-$500, and that’s a box without the metal card. It’s near criminal. 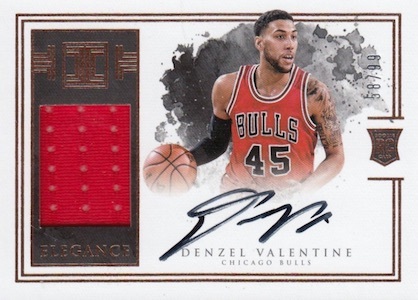 Just about done with Panini products as this seems to be becoming the norm with them on top of watering down products and inflating numbered card sets year to year. Do not, I repeat, do not, waste your money on this product. One box, three redemptions, all worthless, and five other cards with a book value of PERHAPS $30. Four hundred bucks flushed on another product loaded with IOUs. Shame, shame, shame, Panini.